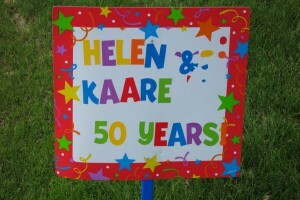 We had a great party yesterday – dear friends and family (Americans, Norwegians, Canadians) gathered to celebrate the 50th anniversary of Helen & Kaare. It was terribly hot and humid – everyone drenched in sweat – but we all had a great time! You mayknow them as raspberries – but to J they are fingerberries because, of course, you put them on the end of your finger to eat them!